8 May 2015, at 9:00a.m. 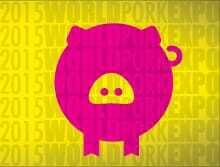 US - Preparations are gathering pace for the World Pork Expo, which take place in Des Moines, Iowa from 3 to 5 June. Ron Prestage, DVM, president of the US National Pork Producers Council (NPPC) and South Carolina pork producer, said: “A tremendous showcase of modern pork production, World Pork Expo is the place to see new products, services and technology, and there’s no shortage of information provided at educational seminars. World Pork Expo’s 310,000 square feet of exhibit space featuring hundreds of exhibitors is open from 8am to 5pm on Wednesday 3 June and Thursday 4 June, as well as from 8am to 1pm on Friday 5 June. Expo also features business seminars and PORK Academy, and free pork lunches at The Big Grill. The World Pork Expo Junior National begins on Tuesday 2 June, with breeding stock sales rounding out the week on Saturday 6 June from 8am until completed (at approximately noon). You can find updates on event schedules and room availability at official World Pork Expo hotels at www.worldpork.org. Until 28 May, the web site also offers convenient registration for the discounted rate of $10 per adult (ages 12 and up), which covers all three days of Expo. Other ways to stay informed include connecting with World Pork Expo on Facebook, following Expo on Twitter (@NPPCWPX, #WPX15), and downloading the free mobile app by searching for 'World Pork' in the Apple Store, Android Market or Blackberry’s App World.